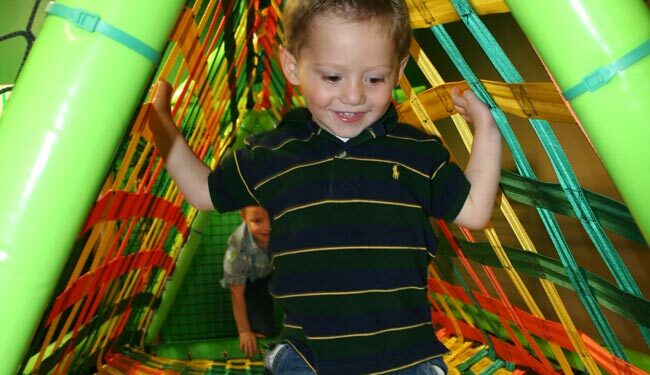 We interviewed Taelor Allen of Little Monkee Bizness, a party center in Shawnee Mission, Kansas, an indoor playground with the main goal of engaging and entertaining active children with fun, healthy play. BEAM: Can you tell a bit about the business? Taelor, Little Monkee Bizness: We’re a children’s entertainment facility specializing in open play and birthday parties. We have a zipline, a soft play area with swings, ropes and slides, an interactive gym for kids, books, costumes, an educational computer and art rooms. We also have a café, so parents can come in and relax with a latte and free wifi while kids get exercise. We opened in November, 2009, and got the Beam video games projector in January. BEAM: What was the need you were looking to fill? Taelor, Little Monkee Bizness: I thought it would be a good amenity. We had the perfect place for it-a dance floor with a disco ball. Kids don’t really like dancing, so it was a perfect spot-we just put a mat down, and it was great. I thought it would be a great way to help the kids interact with each other. They love it. It’s the most I’ve seen parents interact with their kids-they love watching the kids play on it. The parents crowd around and enjoy watching their kids playing on Beam. BEAM: How old are the children? Taelor, Little Monkee Bizness: Under eight. Most are about five to six years old. BEAM: What’s feedback been like? Taelor, Little Monkee Bizness: Great. They really like it. They think it’s a great add on, and they like all the different games. Taelor, Little Monkee Bizness: We haven’t had to do any. The software updates have been happening automatically.